When you come to Lunderby Photography, you’re greeted by a beautiful setting and a friendly team. 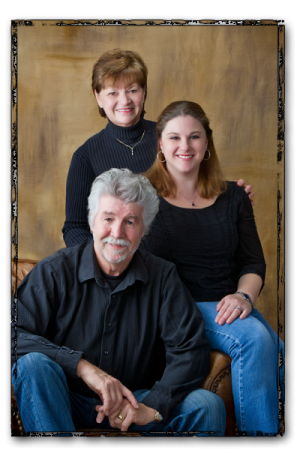 Ken, Kathy and Nicky are dedicated to giving you a pleasant experience and beautiful portraits to be cherished for many years to come! We love to have you come in for a “chat” before the session day. At this appointment we will discuss clothing options, photographic style and where you’ll display your personal pieces of art. This get together is a great way to relieve stress! While you’re here, we’ll show you around our ever changing portrait park. Clients often comment that with our numerous sets and backgrounds, it looks like a Hollywood back lot. You’re certainly not limited to having your session at the studio. We love to make clients’ portraits unique by photographing on location. The Lunderby’s are constantly attending seminars, workshops and conventions collecting new ideas and learning new techniques to better serve our clients. Ken has earned the Master Photographer and Photographic Craftsman degrees from the Professional Photographers of America. Kathy has numerous years of experience in portrait design and framing. She will work with you to create a custom package to fit your needs! Nicky has a bachelor’s degree in art history from the University of West Florida. She is highly skilled in design and an expert in Photoshop! She loves to make people look good! We guarantee that you’ll love both your experience and your portraits when you come to Lunderby Photography!